Bartlett Woods’ continues its sponsorship of free documentary films on Saturday, May 12th, 2PM at The Strand Theatre, 345 Main Street, Rockland. 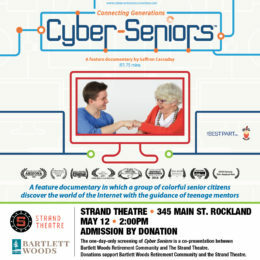 The one-day-only screening of Cyber Seniors is a co-presentation between Bartlett Woods Retirement Community and The Strand Theatre. Cyber Seniors is a humorous and heartwarming documentary feature. It chronicles the extraordinary journey of a group of colorful senior citizens as they discover the world of the Internet through the guidance of teenage mentors. Their exploration of cyber-space is catapulted to another level when 89 year-old Shura decides to create a YouTube cooking video. A spirited video competition for the most “views” evolves as the cyber-seniors’ hidden talents and competitive spirits are revealed. Cyber-Seniors provides insight into the wonderful things that can happen when generation gaps are bridged, proving you are never too old to get ‘connected’. The film runs 75 minutes. Admission is by donation, and donations will benefit the Bartlett Woods Fundraising campaign and The Strand Theater. After Party: Following the screening, the public is invited to a pie and coffee After Party at Bartlett Woods, 20 Bartlett Drive (off Talbot Avenue) in Rockland. We hope to see you there!